There are many who would say Loose Logic is a veteran of the underground, and the emcee doesn’t hide the fact that he has invested many years into the craft. Switching from a rapid-fire delivery to a calm, cool, and collected approach behind the microphone is nothing for the southwest California artist. Add a lyrical depth that earned him the Best Lyricist of the Year at The Write Awards in 2016 and you’ve got a combination that always results in entertainment. 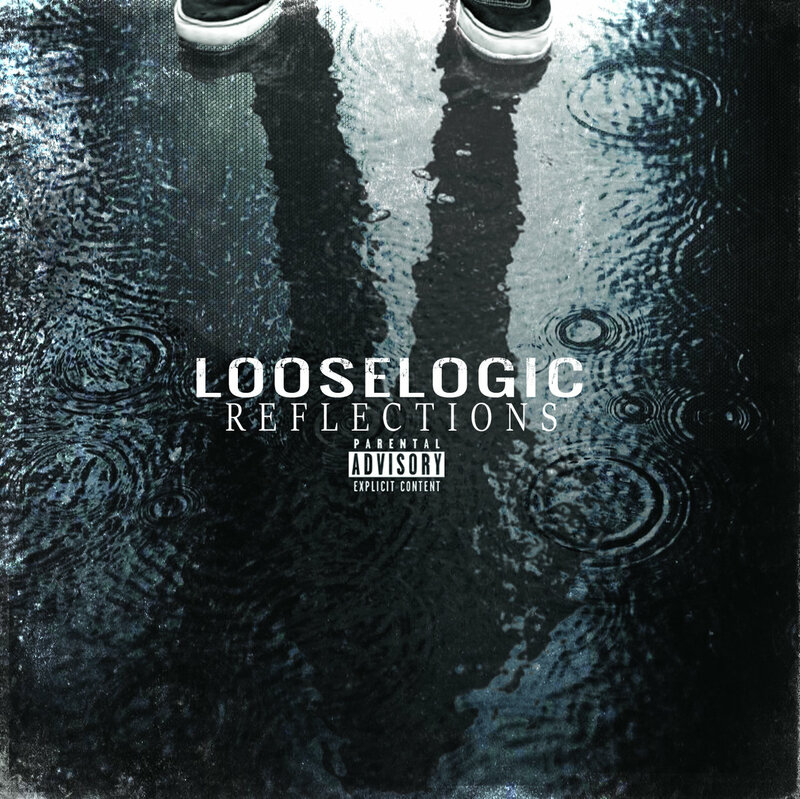 Loose Logic’s latest release, Reflections, has several connecting factors to songs he released earlier in his career, and I think it would be safe to assume this is the reason behind the title of the album. Will the member of The Fraternity succeed in achieving his second classic rating on the website (the first was for Open Door Policy, or will the audience be disappointed with the emcee by the end of the album? Get your copy of The Long Count by Stevey B of DeaDly D here. A calming instrumental eases through the speakers to open Reflections. Loose Logic storms onto the track with a rapid-fire delivery and wastes no time putting his lyrical abilities on display. Similes, metaphors, wordplay, punchlines, and imagery are everywhere as Loose Logic effortlessly switches the speed he spews forth his lyrics. If Loose Logic wanted to begin Reflections with a Featured Track, then he accomplished his mission. This instrumental is bonkers. If I’m going to be frank, the ONLY area Loose Logic could shake things a little better is in his approach on the hook. I feel a slight hype push behind the vocals would have been enough to really set this track apart. In his verses, Loose Logic curates flawless lines filled with thought-provoking lyrics, metaphors, wordplay, punchlines, and stays on topic throughout the song without wavering. This is definitely an impressive track, even for someone with the caliber of quality Loose Logic has and the level of lyricism for which Loose Logic is known. The Featured Tracks list gets extended with the addition of “Devil On My Shoulder”. The entire vibe created on this track makes it a great follow up to “Devil On My Shoulder”. Loose Logic takes the audience a couple different directions in his verses during the song: the only reason he has to continue fighting to succeed, ripping into other rappers in general, and bars that brag about his skills as an emcee. He’s able to bring it all together while chopping multiple syllable rhyme schemes, punchlines, and wordplay behind a hook that will resonate with listeners the more they listen to it. Three tracks in, three Featured Track slots filled. Again, Loose Logic skates through a transition with ease as “Cold World” continues the fighting to succeed lines and blasting bars that bash emcees heard in “No Shame”. I really like how the song is introduced and would have really enjoyed hearing Loose Logic continue on that contextual path. Wordplay and metaphors are spread evenly throughout the verses that are divided by a hook Loose Logic seems to sing at the same note that he sings all of his other choruses, which is fairly higher than the level we hear his voice presented when he raps. The simile game is something Loose Logic tends to lean on a little too heavily. While this isn’t a horrible track by any means, in my opinion, it isn’t a standout song. There’s an intense vibe tied into the instrumental for “Crazy”, which also produces a sense of urgency. Loose Logic brings forward some thought-provoking lyrics while revealing some personal details for listeners. The audience will be hit-or-miss in terms of being able to relate to the track. Add Loose Logic’s vast vocabulary and it’s unlikely that we will hear very many people sing along with “Crazy”. The lone featured guest of Reflections goes to JL of B. Hood, who happens to spit his bars in a rapid-fire fashion that Loose Logic matches with ease. JL’s vocabulary is extensive, to say the least. The previous track proves Loose Logic can properly provide four-syllable words in his content, though he chooses not to do so on “Nobody Else”. The hook is catchy as hell and rides the beat well. Loose Logic may have dumbed down the lyrics a little from the previous track, but that doesn’t mean he slacks lyrically. “Nobody Else” notches another Featured Track for Reflections. I have a feeling I’m not going to be the only one who believes this track is out of place. Normally, Loose Logic’s transition between tracks is pretty much on point. This is not one of those transitions. Loose Logic sings for nearly the entire track, spitting one round of bars in the middle of the song. This track doesn’t feel hip hop at all, really, and the odd placement on the album really takes away from the song itself. I believe there’s a spot later in the album that is much more fitting for “The Youth”. Loose Logic jumps right back into the fast-paced delivery, quick-witted lyrics, and hyped approach that preceded “The Youth” with this track. Leaping back into a lyrical approach, Loose Logic drops wordplay, punchlines, and multiple syllable rhyme schemes throughout “Won’t Resist”, and he brings another hook with a sing-song presentation fairly similar to the blueprint that Loose Logic has demonstrated in earlier tracks on Reflections. “Won’t Resist” is a solid addition to the album. Loose Logic aims to deliver a drinking anthem/party track for the audience with “Roll Out”, or that’s the vibe I got from the catchy hook presented to listeners on the track. A little more lyrical than you would expect a ‘drinking anthem’ to be, “Roll Out” might be the track on Reflections that contains the most punchlines. Loose Logic throws in some wordplay, metaphors, and multiple syllable rhyme schemes to give listeners more than enough reasons to replay “Roll Out”, the fifth Featured Track of the album. This is a track that “The Youth” would have been more fitting to be paired with on the track list for Reflections. “So Lonely” will reach out and touch people emotionally, especially parents. The thought of losing a child is hard enough, but having to go through the process of the actual possibility happening is an indescribable experience. Loose Logic does his best to put his point-of-view into perspective for the audience. His efforts prove to be remarkably relatable. Reflections adds another Featured Track to its list. Loose Logic swiftly switches the subject matter as he laces a ballad for the ladies, in a sense. There isn’t much innocence to be heard as the track shares some of Loose Logic’s past experiences and thoughts. “On And On” could easily be the theme song for an adult daytime soap opera. While the track embodies the concept and may have quite a few people who relate to the subject matter, Loose Logic’s lyricism is pretty much limited to imagery and similies and lacks, in my opinion, an actual message or story. When everything is said and done, “On And On” is rather bland. Loose Logic expresses changes in his way of thinking, reasoning, and his everyday actions. The audience should be able to feel the maturity and growth explained in the verses. Listeners are presented with another chorus that Loose Logic sings at a higher note than he probably should- the same exact note he sings in previous tracks on the album.It would be really interesting to hear Loose Logic showcase his vocal range and stuff like that. While Loose Logic displays a terrific delivery during his verses for the track, the majority of this song gives me a lot of the same vibes that I had during “So Lonely”. After a first verse that feels out of place from the verses that surround it, Loose Logic continues to bring a ‘conscious style’ approach to the tracks on the second half of Reflections. “Tunnel Vision” is Loose Logic’s eye-opening message to be aware of the things going on around us instead of allowing ourselves to be blindly led by people who are not looking out for our best interests nor are being completely honest with us. There is a lot to learn, or at least research if listeners pay attention to the content. “Tunnel Vision” is a solid addition to the album. “No Way” covers a couple of different topics, starting off with a first verse loaded with shots at “new age” emcees and “mumble rappers”. The hook is well-written, catchy, and easily contends for my favorite chorus on the album. Punchlines, wordplay, and metaphors are spread throughout the track. Loose Logic takes a solid stance on certain subjects in each verse as well. There’s “No Way” this track is going to be left off the Featured Tracks list. The final track of the album reaches far back into Loose Logic’s discography to bring the audience a sequel to one of his earliest tracks. Storytelling is one of Loose Logic’s strengths as an emcee. Fighting through life’s struggle and attempting to do the best for his daughter, the main character in Loose Logic’s last track on Reflections has decisions to make as his life progresses. Many of us will be able to relate to this song because we were faced with similar decisions during the course of our life. “One Story: Second Chapter” closes out the album with its final Featured Track. Get your copy of Music On Mars by The Criminal Network here. Ain’t Holding Back, Devil On My Shoulder, No Shame, Nobody Else, Roll Out, So Lonely, No Way, and One Story: 2nd Chapter. If you were to listen to Loose Logic’s entire discography, you will hear his growth right before your very ears. Regardless of the growth that can be heard during the course of his career as an emcee, Loose Logic seemed to always have a focus on lyricism, regardless of a track’s subject matter, but I don’t feel Reflections has that undermining focus. One of Loose Logic’s latest album releases, Open Door Policy, also lacked this constant, undermining focus on lyricism that the majority of even his life-long fans will not notice. Open Door Policy, in my opinion, has more of an impact with listeners than Reflections because of its straightforward style and ability to connect with the audience from the very beginning to the album’s conclusion. Reflections has several areas that will resonate with the audience as well, but there are times when it seems as if Loose Logic gets sidetracked and forgets what the main theme for the album is. His track list is not as smooth as it tends to be. There is plenty of great things to be heard on Reflections. Loose Logic is one of the best I have ever heard at switching up styles during the course of an album. He can spit bars in rapid-fire succession and slow it down at the drop of a dime. He has the ability to change the tone in his delivery with ease. His multiple syllable rhyme schemes are definitely nothing to scoff at, while his lyricism is anything but boring. The topics chosen for his songs are almost always fresh, and if they aren’t, then he finds a new way of approaching them. If you have never heard one of Loose Logic’s albums, then Reflections will be pleasing to the ear and will likely captivate your thoughts. Loose Logic adds another great album to his discography. Loose Logic can be found on Facebook!